Fire glass is the perfect way to enhance the look of an old fireplace or fire pit and delight visitors t the same time. 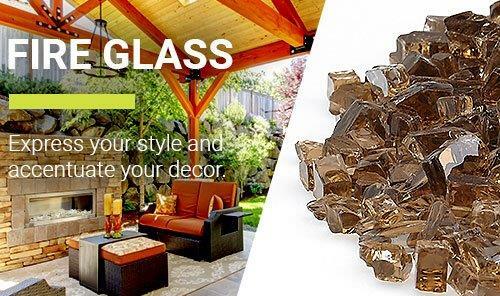 If you are bored of looking at the same old gas logs and exposed piping, these radiant glass pieces will turn that drab fireplace or fire pit into a spectacular display; sure to delight all onlookers and become the focal point of all conversations. Available in various shapes and sizes, our beautiful fire glass is made from tempered glass allowing it to withstand extreme temperatures without losing its color, shape, or shine. Furthermore, fire glass will not emit any smoke, ash, or toxic fumes and is very low maintenance. Ideal for both indoor or outdoor environments, fire glass may be used in either natural gas or propane fires. It is also a great addition to aquariums!